As announced by Activision and Treyarch earlier this week, the Free Trial for Call of Duty: Black Ops 4’s Blackout Battle Royale mode is live now on PlayStation 4, Xbox One, and PC via each platform’s respective stores. The Free Trial for Blackout is available on PS4, Xbox One, and PC from January 17 through January 24 at 10AM PT allowing anyone on those platforms to try Black Ops 4’s Blackout mode. Players can download Blackout to try for free during the trial duration and check out Call of Duty’s first ever Battle Royale mode. The trial is available to download from the PSN Store, Xbox One Store, or Battle.net. An Activision Support article has provided additional details on how the Blackout Free Trial will work. Players that are playing the free trial will be able to team up with players who not only are also playing the trial but also team up with anyone who owns Call of Duty: Black Ops 4. After downloading and installing the Blackout free trial from your platform’s store, you’ll be able to immediately play Blackout as Solo, Duos, or Quads. (Please note: In certain regions, only one game mode will be available at a time.) Since you’ll be playing with the greater Call of Duty community, you’ll not only be able to party up with friends playing the Blackout free trial, you’ll also be able to party up with friends who already own Call of Duty: Black Ops 4. Free Trial players will not be available to access any personalization gear during the trial period, nor purchase Call of Duty Points. Activision says that players will have to purchase the full game to get access to the Paint Shop, or the Emblem Editor. In terms of player progression, free trial players can earn new Echelon levels (there’s no limit beyond the game’s 80 level limit) and rank up in Tiers in the Black Market, but the content from the Black Market cannot be accessed. Activision has confirmed that if you do decide to purchase the full game after the trial, all of your unlocks will be available to use then. Blackout free trial players will earn Echelon Progression and unlock Tiers and loot through the Black Market, which will be banked but inaccessible within the free trial. However, if you upgrade to the full version of Call of Duty: Black Ops 4 (all platforms) or the Battle Edition of Call of Duty: Black Ops 4 (PC only), you’ll immediately gain access to all the progression, loot, and rewards you’ve earned. All players need to have a Call of Duty account in order to access the free trial. Players will be prompted to create one or sign in once you load up the free trial. 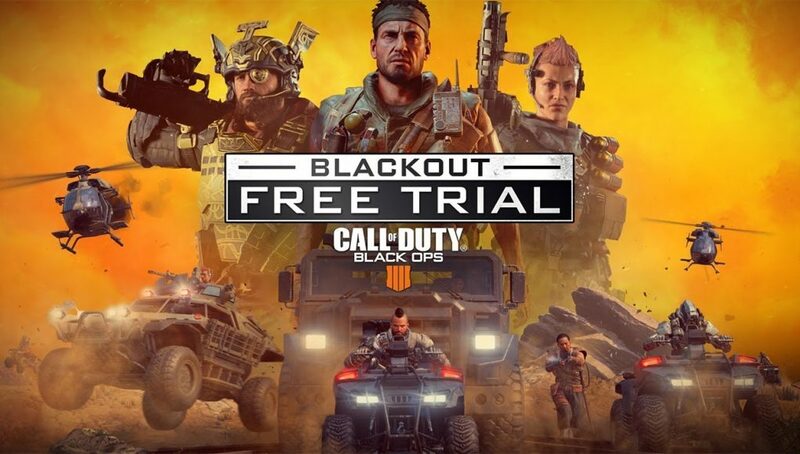 For PlayStation 4 players, PlayStation Plus is not required to play the Blackout Free Trial. Xbox One players need Xbox Live Gold in order to play, and PC players need an active Battle.net account. This is the first free trial for the mode since the game’s launch on October 12. There is no free trial announced for MP or Zombies at this time. Here’s a trailer for the trial, which was released earlier this week. Treyarch has added in a new LTM for Blackout this week on PS4, alongside a brand new looting interface for console players. More updates for Blackout are coming, with details to be announced soon. Activision has not announced any plans for Blackout to be free permanently, but we’ll update if there’s any news on that front.